In this age of technology, it’s time for companies to be willing to exploit new business opportunities. More than ever before, companies are navigating this fast-pace and uncertain terrain. Bankruptcies, mergers, acquisitions, reductions, etc… It’s all changing the business landscape. But if companies do not exploit new business opportunities in fear of failing, then they are sure to fail or fall behind competitors. As financial leaders, how do we enable our leadership to take risks without neglecting the numbers? The reason why one would exploit new business opportunities is to stay ahead of the ever-competitive marketplace. What needs are not being fulfilled yet? How can you gain more market share? What competencies does your company have that can be expanded into other areas – customers, markets, etc.? Opportunity exploitation is what keeps businesses moving forward. In this day and age, we need to continually reinvent our companies or we will not be around very long. Our competitors are doing this every day. Have you identified any opportunities yet? If not, then click here to access our External Analysis Whitepaper. According to Wiley Encyclopedia of Management, “opportunity exploitation refers to activities conducted in order to gain economic returns from the discovery of a potential entrepreneurial opportunity“. Typically, entrepreneurs are known to exploit opportunities or identify opportunities because it is in their nature; however, financial leaders know what the numbers say and can identify opportunities that make economical sense for the business while balancing risk and reward. E-commerce has been growing significantly while brick-and-mortar stores have been steadily decreasing. Shopping malls are more vacant than ever before. But there is one company that is taking advantage of those vacancies and benefitting from it. In a recent Wall Street Journal article, “Planet Fitness Inc. is the rare mall tenant expanding its share of commercial real estate even as many retailers shrink their physical footprint as more commerce moves online.” This is a great example how to exploit new business opportunities. Furthermore, Planet Fitness is focusing on those that do not already have gym memberships. This combination of target market and location is proving profitable for them as they have reported “revenue increase 31% to $140.6 million compared with the same three-month period last year”. Experience is the prime ground for preparing yourself or your company for opportunities. Identify what experiences your team has and what your company is good at. For example, if your company excels in supply chain and logistics, then an opportunity that needs incredible supply chain and logistics processes will be a good fit. Incubation refers to the brain processing a potential idea or opportunity subconsciously. They are already attempting to solve a problem that they haven’t yet written down. This is an ongoing process. Then, in the insight stage, an entrepreneur will have the “eureka” or “ah-ha” moment where it all makes sense. As a financial leader, it’s important to talk with your CEO about their ideas so that you can engage in this insight stage. You may even see how to exploit the opportunity before the CEO does. The idea is feasible and you move forward. Finally, the elaboration stage is where you exploit the new opportunity through business planning and implementation. For example, a steel manufacturer primarily sells to commercial developers who require the steel for building and/or roadways. One day, they realized that they were not using any scraps of steel, and the company was just throwing them away. Instead of continuing to throw away those scraps, they inquired whether there was an opportunity to take advantage of it. One day, the entrepreneur stumbles across a custom scrap metal design company where they create home decor out of scrap metal. The entrepreneur goes back to his CFO to discuss this potential idea. The CFO knows of a team member who actually does this in his spare time. They gather a team and start outlining a business plan. Eventually, they decide that it is a profitable idea, and they go forward with it. If you are not familiar with the petrochemical sector, they are experts at this. Nothing goes to waste in the petrochemical business. A chemical is made or processed, it generates a bi-product or waste, and there is always another business in the petrochemical space that buys it to make yet another product, and on and on and on… Eventually, very little is true “waste”. So, how do you go about managing new business opportunities? It is so easy for entrepreneurs to get caught up in their ideas and chase “squirrels“. They lose focus and may not capitalize on the opportunity sitting in front of them. As a financial leader, it is crucial for you to manage those new business ideas as part of your strategy to improve profitability. First, conduct a SWOT Analysis on your company with your team. A SWOT Analysis stands for Strengths, Weaknesses, Opportunities, and Threats. There are two view points in this analysis: internal focused and external focused. This analysis provides a comprehensive look at what your company does well and what it may be lagging in. This also helps the CEO/entrepreneur figure out what opportunities they need to look for to convert those weaknesses to strengths and those threats to opportunities. 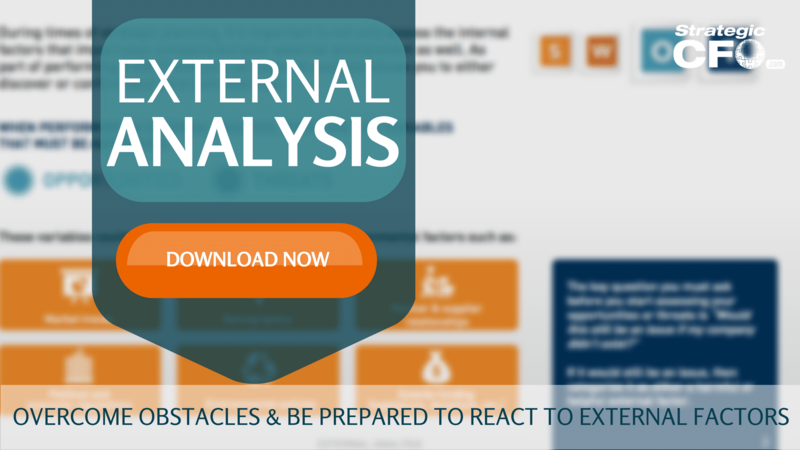 If you want to get started on your SWOT Analysis, then click here to access our External Analysis Whitepaper. Then, enable your CEO to make calculated risks. Entrepreneurs need to take risks and make moves – that’s part of their nature and gift. But, they do not need to make uncalculated risks or risks that will cause more harm than good. As the financial leader, help them to mitigate risk and enable them to do what they do best – find opportunities and grow the business. Do you know the opportunities and threats that your company faces? If not, then the time to figure it out is now. Click here to access our External Analysis to gear your business for change. Good Post keep writing and sharing with us.